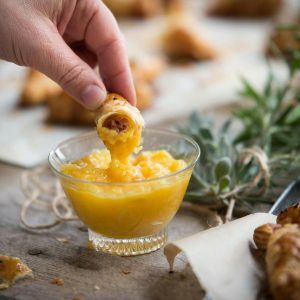 Upcycle leftover Christmas ham into the perfect Boxing Day breakfast: Ham & Cheese Croissant and serve them with a jammy spiced mango dipping sauce. They are great as a starter or finger food, if you’re planning to entertain beyond Christmas Day. Serve croissants with the dipping sauce, warm or chilled. 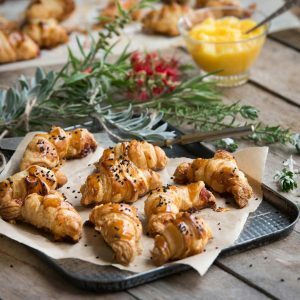 Store leftover cooled croissants in an airtight container in the fridge for up to 2 days. Reheat for 5 minutes in a hot oven if desired. Defrost the pastry, unfold it on work surface, dust pastry and work surface with flour. Line two baking trays with baking paper. 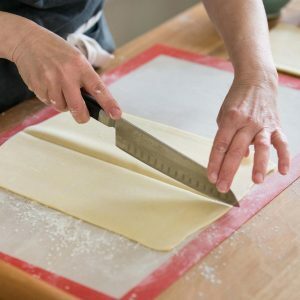 Cut the sheet of pastry in half. Take each half and roll it out to roughly 32cm x 24cm. Cut each rolled piece in half lengthways, so you end up with 4 long rectangles. 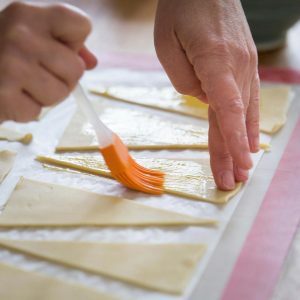 Working down the longer edge of each rectangle, cut each rectangle into 6 triangles – you can use the scraps from the side to make an extra triangle by sticking the straight sides together. Brush each triangle with beaten egg. Place a mouthful-size amount of ham onto the widest part of each triangle and sprinkle with cheese. Working with each pastry triangle, roll up the pastry snugly from the long edge toward the shorter. Form each into a crescent shape and place on the lined baking trays. 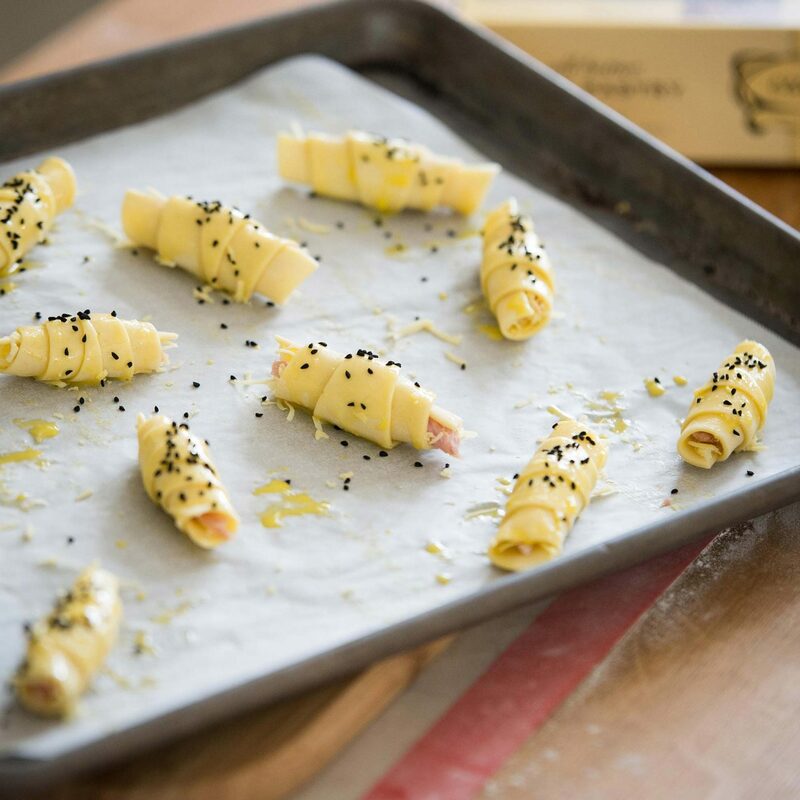 Lightly beat the egg and brush each croissant with the egg-wash, sprinkle with the nigella seeds. 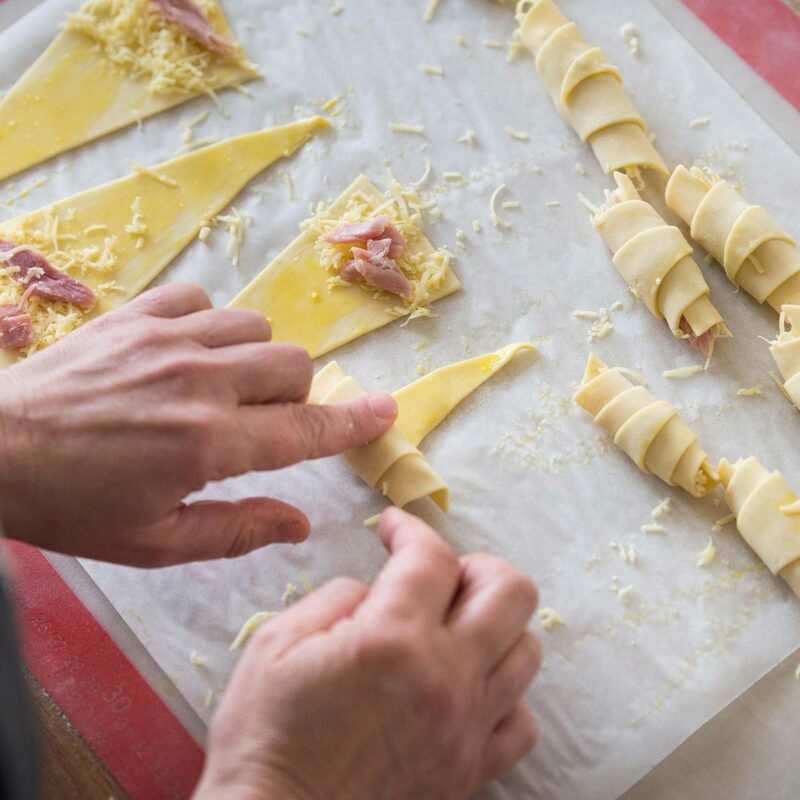 Bake in the preheated oven for 15 to 20 minutes or until the croissants are golden. Remove from oven and allow to cool on a wire rack for 10 minutes before serving. Meanwhile, prepare the spiced mango dipping sauce. Peel mango and place flesh along with the remaining ingredients in a small bowl of a food processor. Pulse until semi-smooth. Transfer to a small saucepan set over medium high heat and bring to a simmer. Cook, stirring, for 5 minutes for the flavours to intensify. Turn off the heat and transfer the sauce to a serving dish. Store leftovers in an airtight container or jar in the fridge for up to 5 days or freeze for up to 3 months.